Monique Tyacke is an Australian Artist living in Collaroy in Sydney. She received her Bachelor of Visual Arts Degree from The University of Sydney - Sydney College of the Arts. After graduating from SCA, Monique moved to New York City, and over the next few years studied various courses at several art schools - including New York Academy of Art and NYC School of Visual Arts. In the 10 years she lived in NY, Monique painted numerous commissioned pieces, sold her paintings and drawings on the streets of Soho, and was also included in several group exhibitions. 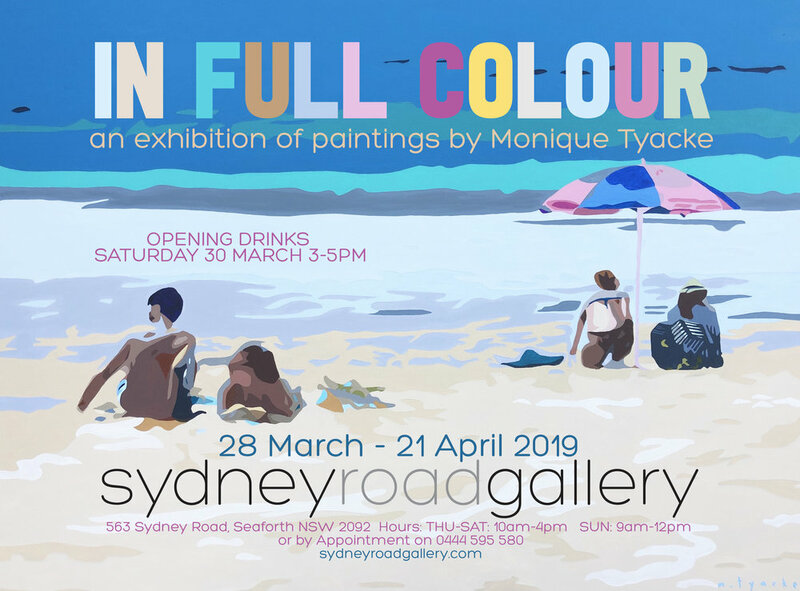 Monique's exhibition - In Full Colour - explores everyday life on Sydney’s beaches using a simplified abstract style. Monique draws from her own photographs, simplifying the details while still leaving enough of a representation for the viewer to interpret the painting in an engagingly graphic way. The ocean and coastal landscape are a constant source of inspiration for her paintings. Her paintings have a feeling of nostalgia, usually a memory of a particular time or place that was once experienced, and are easily relatable to the viewer. The paintings in this exhibition include the human form, and show how people interact and enjoy the beautiful coastal landscape. Monique has previously exhibited at Sydney Road Gallery, as well as the Warringah Art Exhibition, Northern Beaches Art Prize, The Other Art Fair Sydney, Balmain Art Show, Paddington Art Prize, Art Gallery on Darling, ME Artspace Fundraiser, and Fenton & Fenton’s School of Art Fundraiser. Her paintings are in private collections throughout Australia and the United States, UK, France, Japan, Belgium and South Africa.